Facilities: Central heating, a fully fitted stainless steel kitchen, shower and toilet facilities and dedicated special needs facilities. About the building: Opened in 2003, Rowallen is an environmentally friendly building constructed of Scandanavian pine. It is on the Main field, close to the Climbing & Traverse Walls, with its own fenced off grass area. Cost includes: Camp fees, all gas and electricity, kitchen utensils, cutlery, mugs, plates, bowls for 30 people. 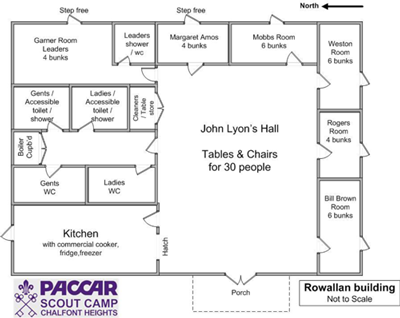 Book early to avoid disappointment, Rowallan Building is one of our most popular accomodations.